New Home Community With Waterfront Lots, Swim Club & Pier. 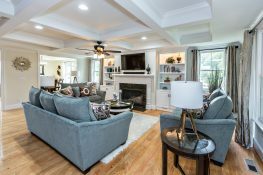 Live the coastal lifestyle at Founders Pointe, a waterfront community centrally located in Hampton Roads, and discover the perfect pairing of yesterday’s hometown feeling with today’s convenient lifestyle. Life at Founders Pointe begins at home, with quality homes tucked into quiet lanes and private cul-de-sacs, made all the more inviting by marsh, creek and wooded views. Ten custom homebuilders are providing a wide array of innovative home designs featuring a variety of distinctive architectural styles. Click here to see our Available New Homes for sale. This award winning waterfront community was selected site of the Tidewater Builders Association’s 2010 Homearama and also the site for the PHBA 2016 Parade of Homes . Overlooking the Batten Bay, with creeks and tributaries flowing to the James River, there’s never a shortage of breathtaking vistas and outdoor activities. Residents enjoy resort-style amenities including a Residents’ Club and pool, a 112′ water slide, a children’s playground, leisure trails for walking and biking, a Community Pier that overlooks the Hampton Roads and Batten Bay, and more. Even socializing with your neighbors is made effortless at Founders Pointe, with a year-round calendar of social events planned by the Residents’ Club Coordinator. With quality custom homes from $400,000 to over $1 million, this community provides you with not only the home of your dreams, but the opportunity to live the lifestyle you have always dreamed of living. Founders Pointe is centrally located to all of Hampton Roads, near the historic town of Smithfield, just 3 miles south of the James River Bridge in the Carrollton area of Isle of Wight County – a quick 10 minute drive to the Peninsula, 10 minutes to I-664/ Harbour View, or 25 minutes to downtown Norfolk. For more information, call (757) 238-9009. The Information Center and model homes are open daily. New homes and a limited number of waterfront homesites are now available.